Professor Usha Haley from Massey University’s College of Business with her award immediately after the Academy of Management awards ceremony in Boston. A Massey University professor has received a prestigious award for two decades of research that has directly influenced policy in the United States and Europe. 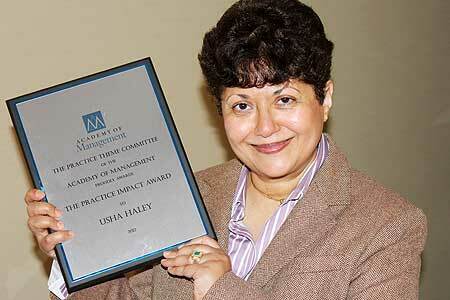 Professor Usha Haley received the Academy of Management’s 2012 Practice Impact Award last week at a gala ceremony in the United States. With more than 20,000 members globally, the academy is the world’s largest and oldest association of management scholars. The award recognises an outstanding scholar who has had a major impact on practice-based studies, something that Professor Haley considers very important. She received the award for research that had directly influenced US federal policy, particularly the relationship between the USA and China, and her work on strategic trade issues, which has helped form the basis for anti-dumping regulation in the EU and elsewhere. She is one of a very small group of management academics whose research has directly affected federal regulation and, therefore, companies’ operations. Professor Haley said she saw industries like steel, paper, glass, auto parts, and solar power changing over very short periods of time. She saw the human impact of disappearing jobs, and a societal need to understand trade through an organisational perspective. Professor Haley’s body of work on emerging markets has been built up over two decades and includes a number of books: The Chinese Tao of Business, which the Wall Street Journal said was “the only book on Asian business to buy”; Multinational Corporations in Political Environments; and New Asian Emperors. She also has a new book entitled Subsidies to Chinese Industry: State Capitalism, Business Strategy and Trade Policy near completion. It draws on five years of empirical research on global industries, and several testimonies she has given to the US Congress on this research. The Oxford University Press will publish the book in early 2013. Professor Haley said she was “thrilled, honoured, and humbled to receive such an award from my peers”, and rated the award as among the highest honours she had received so far in her academic career.